Cockscomb basin boasts many waterfalls. Visitors are much more likely to see them than the elusive jaguar. 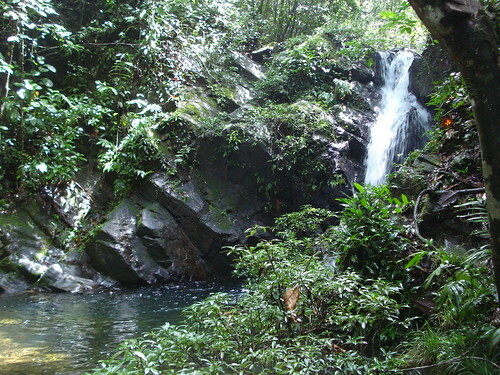 One of the reason’s I chose Belize as a setting for my stories is that the country hosts the world’s first jaguar sanctuary: Cockscomb Basin Wildlife Sanctuary. In the early 1980s, Dr. Alan Rabinowitz came to Central America to study jaguars and found that this region of Belize had the highest population density of jaguars. That finding, along with the interest of government officials and Belize citizens, led to the area being designated as a wildlife sanctuary. Today, the preserve is home to hundreds of species of flora and fauna, as well as mountains, waterfalls and other rain forest terrain. It’s definitely on my bucket list to visit someday.